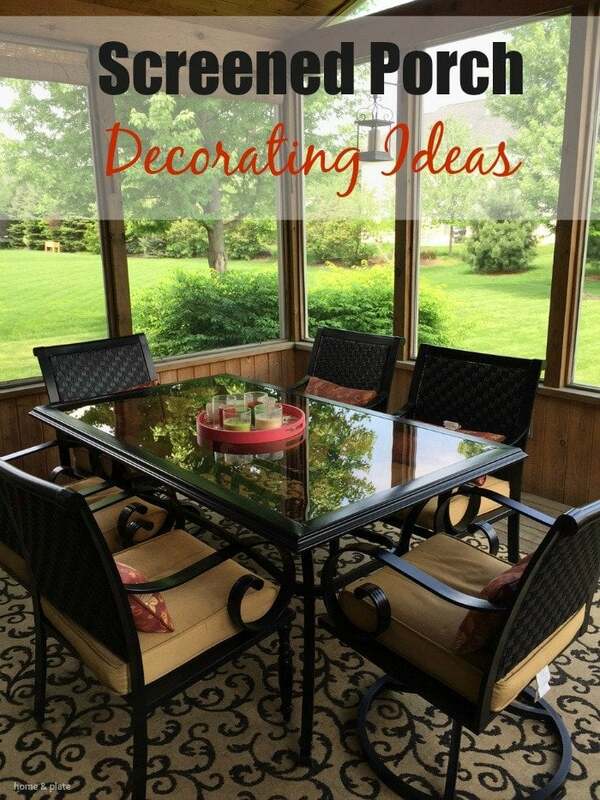 With spring approaching it’s time to start thinking of decor updates, specifically screened porch decorating ideas. We spend many summer nights on our screened porch, watching our children play in the backyard or spending time with neighbors. It becomes our official dining room during the warmer months. So how do we keep it cozy and inviting? I’m sharing these simple screened porch decorating ideas we used for our porch that defines our outdoor living space that we love so much. Keeping it simple and streamlined is key. 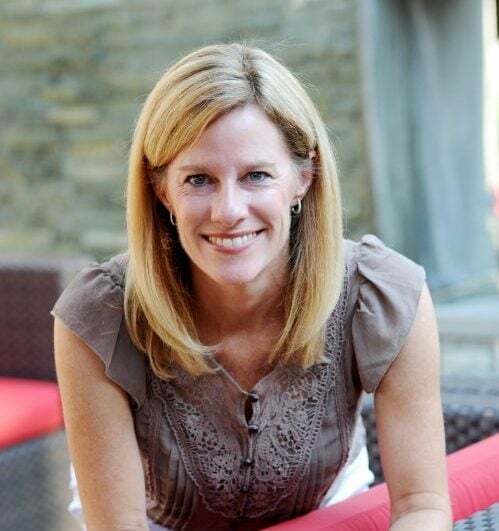 Through trial and error we have discovered the right furnishings and accessories to suit our lifestyle, the weather and to keep our small screened porch from becoming cluttered. Each spring I start with a good cleaning. I hose down the wooden floor and clean the dirt and pollen off the metal furniture. 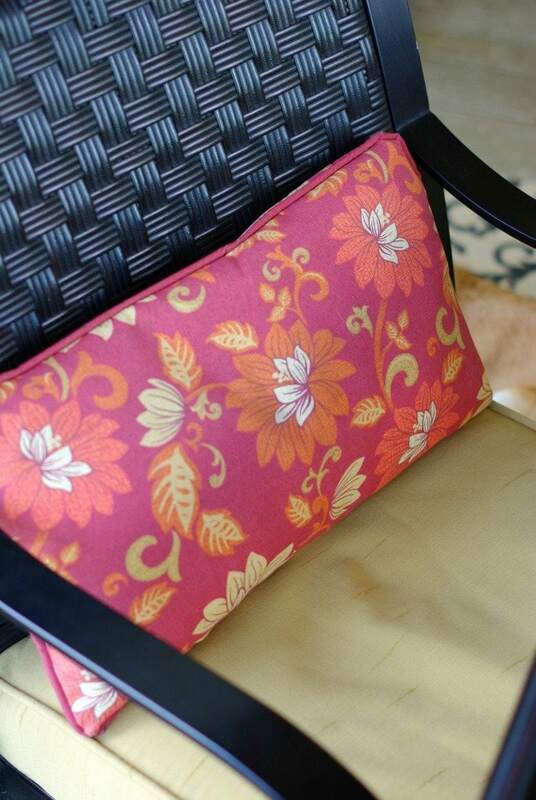 I bring the screened porch rug and furniture cushions out of storage. They are still in great shape after many years of use because we store them inside during the winter months. Our screened porch provides enough room for a dining table and chairs. We chose stylish, weather resistant furniture that doesn’t break the bank. For a small space, we chose this over a sofa set because we planned to use it at meal times. We spend a lot of dinners together on the porch as well as weekend breakfasts. It’s wonderful to be shielded from the bugs, the sun and the rain. The overhead fan and light allows us to enjoy our porch once the sun goes down. 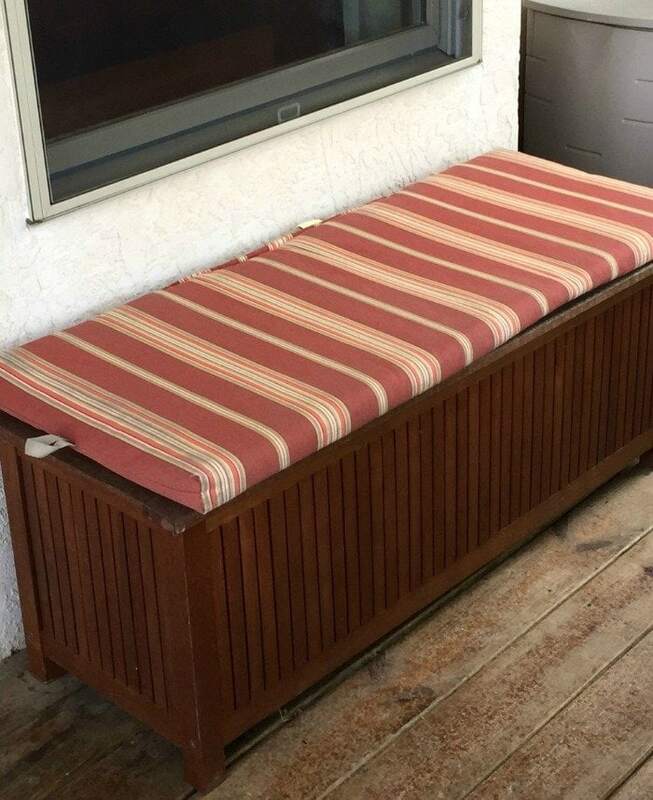 We invested in a storage bench that also doubles as seating to hide sports equipment and yard toys. Keeping toys in their proper place keeps our small screened porch from looking cluttered and unkempt. Last year we invested in a flat screen smart television that we mounted undercover so we can watch Reds baseball during the summer while still enjoying the outdoors. We also stream music from the TV when we’re in the mood for tunes. I hung brackets on two of the posts so we can enjoy lanterns for a little extra mood light. Some years I have hung ferns for extra color. 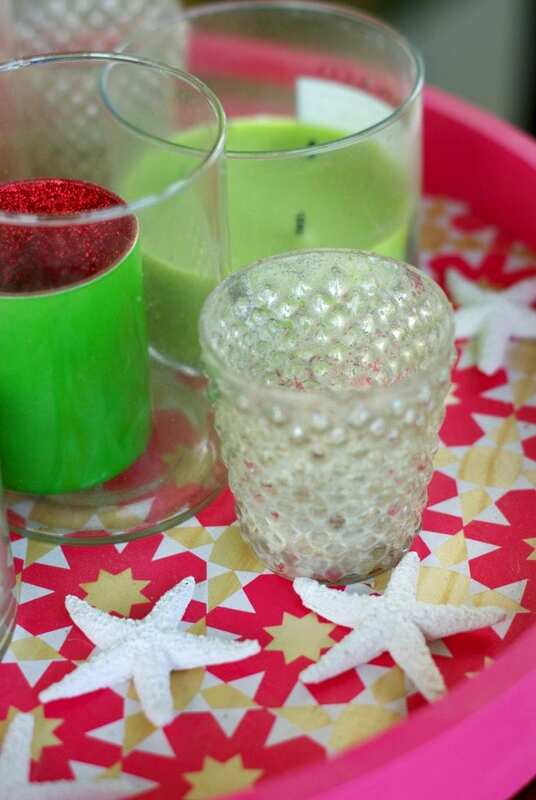 The table centerpiece provides a pop of color and extra lighting when the sun goes down. Around the dinner hour the sun shines brightly in from the west. Two PVC roll up shades in a woodgrain color from Lowe’s provide the shade we need from the sun. Our screened porch really is another room of our home and we love that it is inviting and welcomes company in. Well decorated and well planned screened porches extend the living space of your home. Enjoy summer outdoors in your screened porch. 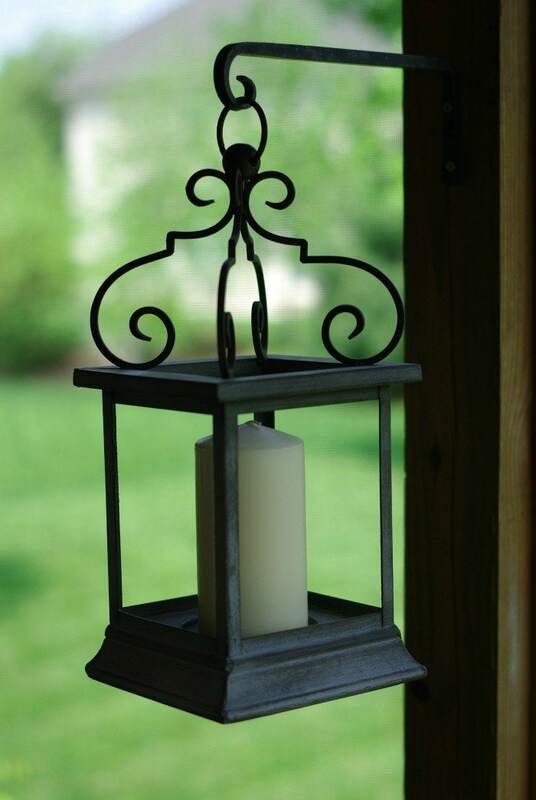 If you use any inspiration for your outdoor space, be sure to snap a photo and hashtag it #homeandplate. I’d love to see what your space looks like! 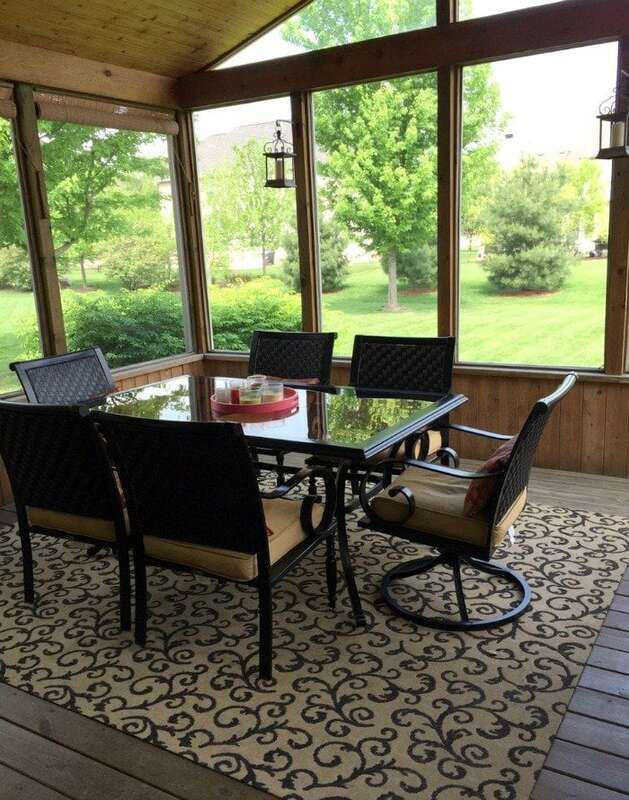 Thank you for sharing your description and photos of your beautiful screened-in porch! I was wondering if you could briefly explain the screen in your windows – is it like a black mesh? Did you make them yourself or buy them? Right now we have storm windows on our front porch but would love to replace them with something similar to yours. Thanks! The screen is a black fiberglass screening material that is attached to an aluminum frame. We then have wood trim covering the frames and keeping them securely intact in the space. We have had to have the panels replaced over the years because of the effects of nature and pesky squirrels that climb to the roof and damage the screens. I have had them replaced at our Roush hardware (similar to Ace) which has a department that makes new screen windows, including new screening and frame.